“The Look,” by Roxette thumped in the background as I entered the empty dining room of Yoki, a new Japanese restaurant in Central Square. The plastic white walls changed colors every 20 seconds with rainbow lighting. It felt like Yoki was trying very hard to by hip and happening, but missed their target by a few decades. I was a solo diner, grabbing a quick bite before Bridge. I ordered the Nigiri plate ($23), which was 10 pieces of sushi, 6 pieces of maki, and it came with miso soup and salad. My salad was ice cold, almost frozen, and drenched with the ubiquitous carrot ginger dressing. 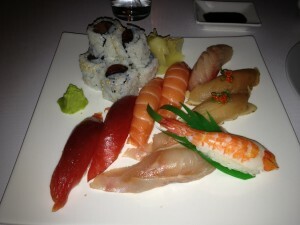 My sushi was inconsistently cut – some pieces were large and cumbersome, some were thin and ragged. The rolls were flavorless, as was most of the fish. The salmon was probably the only passable selection. I didn’t have high expectations, but I’ve have better sushi from a supermarket. I’m going to bet that there will be a new restaurant in that space by next year.